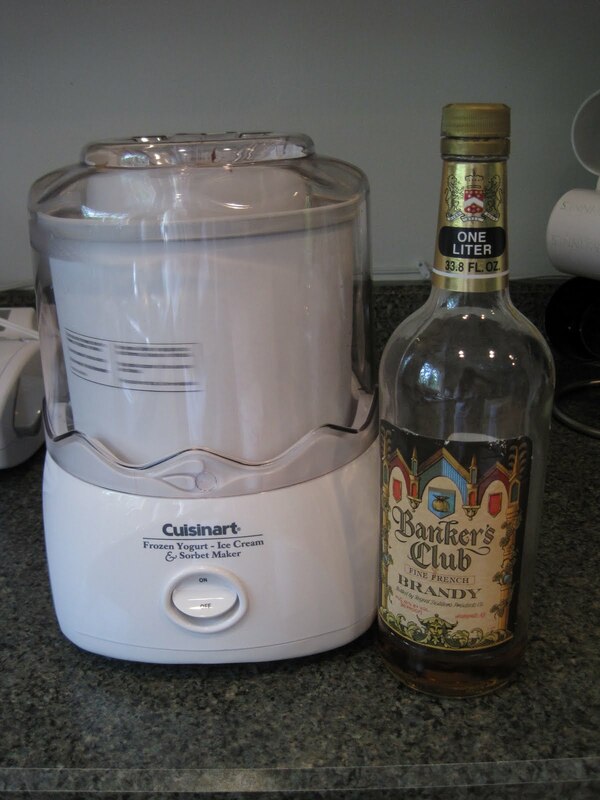 SP and I decided to make ice cream last weekend. A couple of weeks ago we made a mango sorbet for our first experience with the new ice cream maker and now it was time to make ice cream. 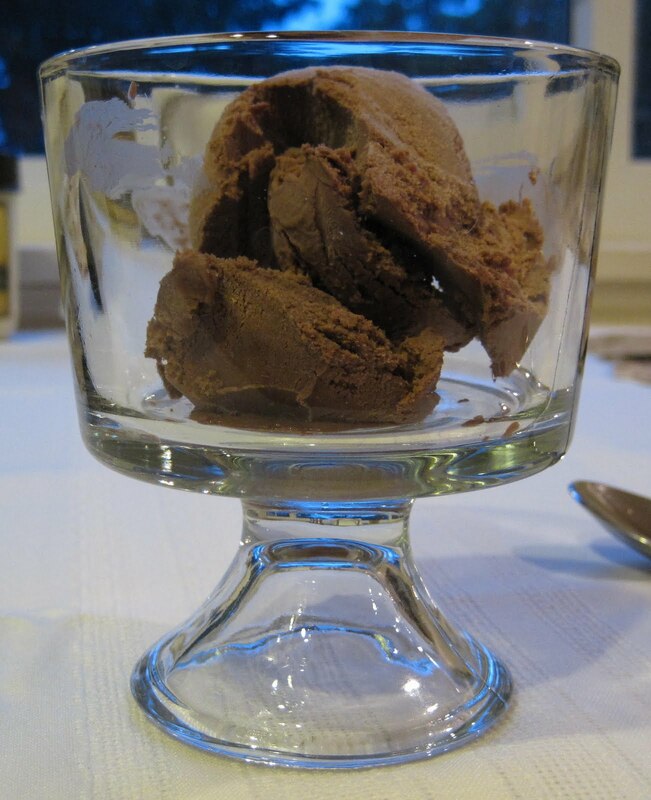 We decided on Mexican Chocolate Ice Cream. Sunday evening we gathered the ingredients. Six eggs (not the whole dozen in the photo! 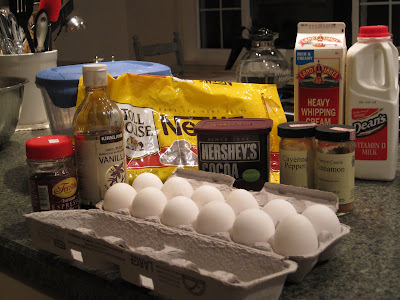 ), sugar, heavy cream, and whole milk - yikes! Good thing we each eat a smallish scoop at a time! 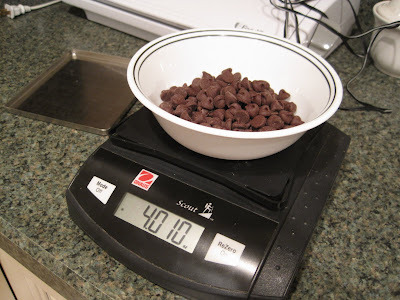 SP used the scale to make sure we got 4 oz of chocolate. SP wanted me to photograph his egg separating technique! 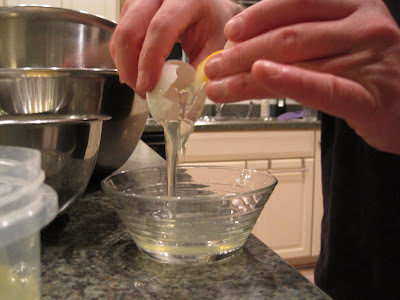 Separating eggs is actually pretty easy, you just need to be a bit gentle with the egg. This recipe uses 6 yolks; we now have 6 egg whites to use in an egg white omelet. The first step was heating 1 cup of heavy whipping cream with the cocoa powder. 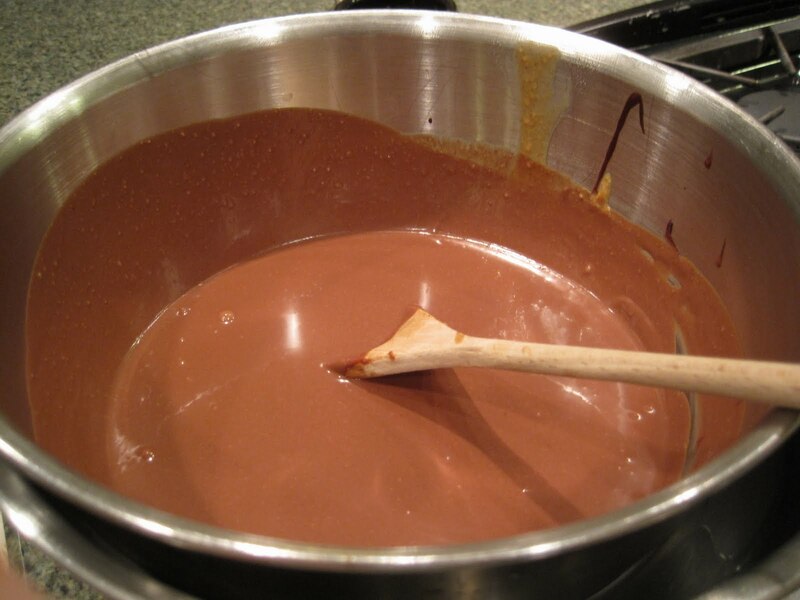 The warm cream-cocoa mixture was then mixed with the 4 oz of chocolate in a metal bowl which was then placed in an ice bath to cool. 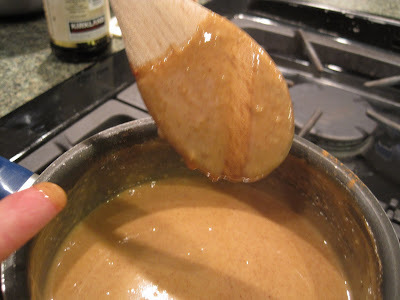 Above is our wooden spoon showing the custard properly coating the back of the spoon. It coated the spoon but didn't run after we swiped a finger through it. 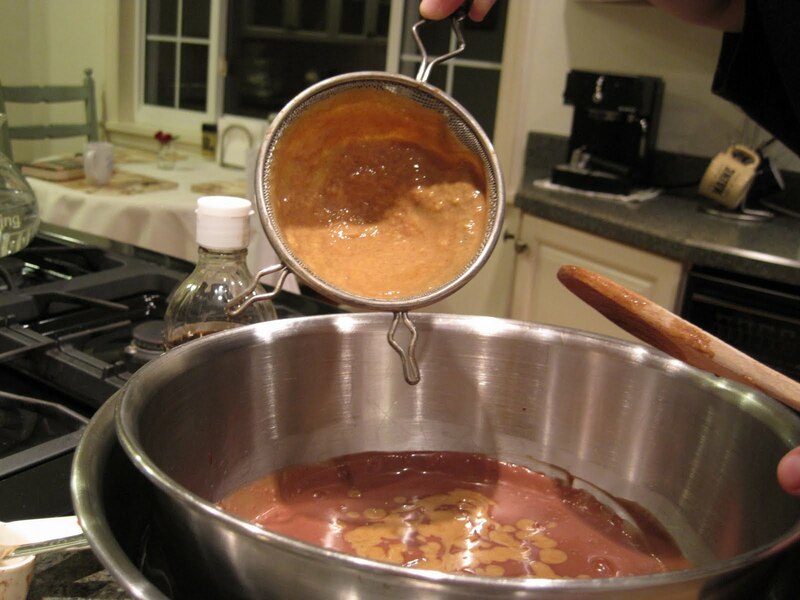 The custard is the other cup of cream, milk, espresso powder, cinnamon, cayenne, salt, and sugar mixed in with the 6 yolks. We poured the custard through a mesh strainer and into the chocolate mixture in the ice bath. 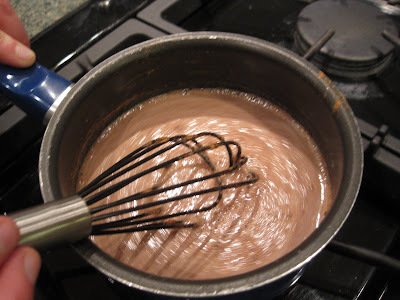 Mmmm tasty chocolate mixture, which we refrigerated overnight. Monday morning, we added the recommended 2 tbsp of brandy to the chocolate mixture and processed it in the ice cream maker. When I posted about the mango sorbet and how it got very hard in the freezer, Snickie commented that adding some limoncello or vodka might help it stay softer (she likes to add some to her sorbets). That sounded like a good idea. This recipe says to add the brandy if you plan to keep the ice cream in the freezer for a few days instead of eating it the day you process it. I suppose a small amount of alcohol, which wouldn't freeze if placed in the freezer, would keep the custard/sorbet from getting too hard. Maybe we did something wrong, or maybe our freezer is super cold, but the brandy didn't keep the ice cream from getting too hard! When we pulled it out one evening for dessert, it was pretty darn hard and we had to let it soften for a bit. It was, however, softer than the mango sorbet, and we didn't have to let it soften for as long, so maybe the alcohol does help a bit. The ice cream has a wonderful taste. I taste the chocolate and cinnamon most. The cayenne is the slight after taste. And the coffee is there, you just can't really pick it out. I think if it wasn't there, it'd be missed. SP really likes this flavor, too. We added generous amounts of cinnamon and espresso powder and just a pinch of cayenne. I think next time we would add a bit more espresso powder. If you like a bit more cayenne taste, you could add more than a pinch, but for me a pinch is the perfect amount. I couldn't taste it as I ate it, but it left a nice bit of lingering heat/spice on the back of my tongue. 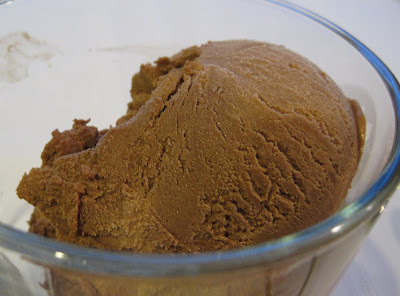 We'd definitely make this ice cream again. I really like it. I broke my 'only one scoop per day' rule for this ice cream! Yay for ice cream experimentation! I actually just got David Lebowitz's ice cream book, "The Perfect Scoop" and he basically says there is no real way to prevent the homemade ice cream from getting really hard. Its because of the home-machine and home freezer temps. He just suggests pulling it out of the freezer and letting it sit before you serve. Hmmm.